Disneyland is a magical place. It's a place of dreams. A place of happiness. A place of love. That love comes in many forms, from the familial love of parents taking their children to the Happiest Place on Earth for the first time to the love that repeat visitors have for the park itself. And of course, there's the love of "Happily Ever After." 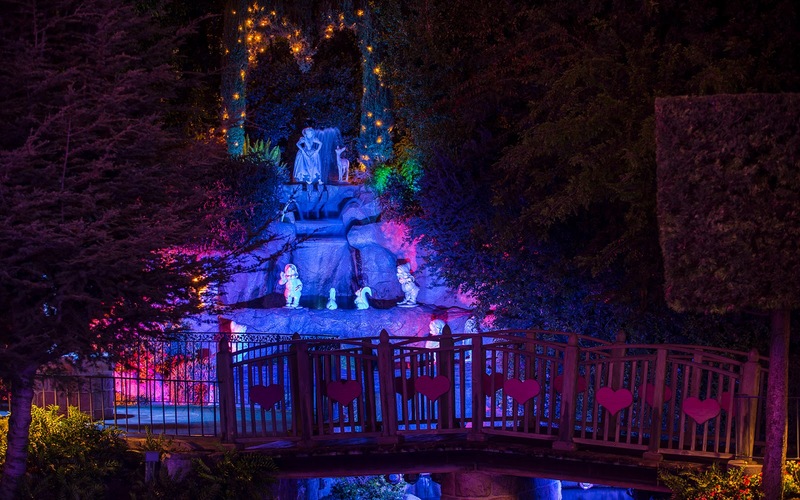 The sense of romantic love burns bright around Snow White's Wishing Well, especially during the night. The purple and magentas coupled with the hearts lining the bridge and the sweet melody of Snow White wishing for her charming Prince (not to be confused with Cinderella's Prince Charming) add up to a very lovey dovey atmosphere, and that is the ambiance I've tried to capture in the photo below. Snow White's Wishing Well bathed in the romance of the night. If all of this is too mushy for you, well, I just wanted to post something in the spirit of Valentine's Day, for all those who are celebrating it.